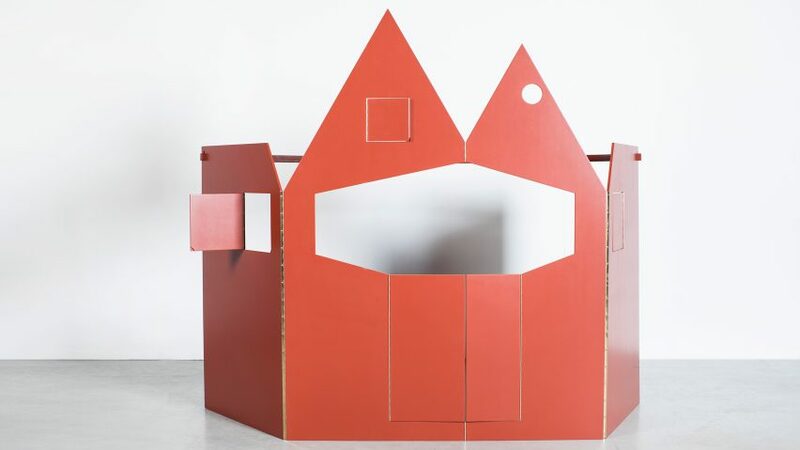 Belgian studio Robbrecht en Daem has turned its hand to children's toys with a puppet theatre created for design brand Valerie Objects. Robbrecht en Daem, which previously designed the Market Hall in Ghent, blended modern architecture with the typical shapes of fairytale castles to create a pointed facade. The puppet theatre, which comes in red or black painted wood, launched at this year's IMM Cologne furniture fair. A pair of pitched "medieval-like" rooftops top the structure, which includes various cut-out sections and shuttered windows to accommodate the theatrical action. The structure can be folded into itself when not in use, for storage. "It is a return to my childhood," said the firm's founder Paul Robbrecht. "As a kid I grew up in a small town in Flanders called Lovendegem. Every week a local family set up a puppet show in the tiny backroom of a cafe. It felt like a miniature theatre. I was utterly mesmerised." Robbrecht used the same measurement system applied to every other project his firm tackles – based on the numbers three, five and seven, and the proportions used by architect Louis Kahn. The theatre is intended as an alternative to the "foul cacophony of shapes and colours" that feature in many toy shops, with its more sober appearance designed to encourage children to use their imagination. "This theatre is similar to a box of wooden blocks," said Robbrecht, who became a temporary puppetmaster to test the structure on his own grandchildren, who reacted "quite positively". Valerie Objects has collaborated with several designers, including releasing a collection of quirky cutlery made by Maarten Baas and Koichi Futatsumata. Other labels that have launched products aimed at children include Magis, which worked with Big-Game to release a chair that could be adjusted as kids grow, and Kartell, which unveiled a range of plastic furniture designed by the likes of Philippe Starck and Nendo.